Ah, the London commuting experience. We all have stories to tell, experiences to share, gripes to be grumbled. Thameslink, for example — our current 'service' of choice — provides a different adventure every day, and should be wholly commended to anyone who enjoys problem solving. Other commuters face battles for seats, quality reading time, the chance to flirt, a spectacular view, sweaty armpits, inexplicable delays, chance encounters and the underlying knowledge that they are paying through the teeth for this immersive, itinerant, daily soap opera. Chris Moss recognises the infinite potential of the commute — we're tempted to pun that a rolling stock gathers some Moss. Smoothly From Harrow compiles hundreds of thoughts on the process of getting from A to B. Some are drawn from literature, some from personal experience. Some come in the form of lists, such as '20 productive commutes', 'commuter caricatures' and a twitcher's guide to spotting birds from your train. Among the extended quotations and ephemera are Chris's own observations, which are well considered and often deeply poetic. Smoothly From Harrow is a thoughtful companion on any London commute. It offers reassurance that life is about the journey, not the destination. Even if you live on the sodding Thameslink route. 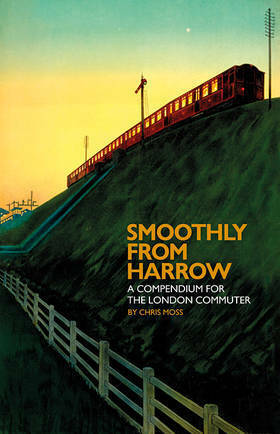 Smoothly From Harrow by Chris Moss is out now from Blue Guides. Black Dog Publishing specialises in compact, colourful guides to aspects of the capital. We've previously enjoyed its books covering classic cafes, fish 'n' chip shops and butchers. The latest guide, as the unwieldy title suggests, looks at the small parks that dot our city. As ever, it's packed with photography, much of it depicting a leafy, verdant, floral London. There's a good spread, covering central London plus all four corner points. Not all the gardens are as 'secret' as the title purports: Battersea and Victoria Parks are hardly well-hidden. But some of the oft-overlooked spaces, such as Red Cross Garden in Southwark, and the Barbican's Conservatory, deserve wider celebration. A lovely guide to the city's green pockets — buy it now and you'll be hankering for summer. Not strictly a London book, but this new photo compilation from English Heritage does include plenty of archive shots of the capital from above. The photos show how the English landscape has been transformed by the motor car, with 150 images from the 1920s to the 1970s. Many of the photographs are previously unpublished. The book coincides with a new exhibition at Wellington Arch, which also includes many of the images. 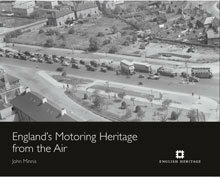 England's Motoring Heritage From The Air, by John Minnis, is out now from English Heritage. Buy direct from the publishers or support your local independent bookshop.